Another well written update! Nice mention/ tie in with Valerio's fic. So Light is headed to a rustic locale. maybe training/ reconnaissance soon? I love the way you guys keep it attached. AND yes this mean that i catched up. I just love this militaristic fan fic, is awesome. The west side of the island was typically barren, mostly because of the difficulty of getting there. The waves crashed upon the white-sand beach. A WaveRunner was tied to a small dock as the sun was an hour away from setting; the reddish light glistened off the clear water. A beach chair and umbrella was set up a few yards from the current tidal level. The green and white patterned umbrella did little to shade the black wolf that was sitting in the chair sipping an orange soda from a margarita glass with an orange slice sitting on the rim and a little paper umbrella sticking out of it. “This is a well deserved vacation,” Temno said quietly as he set the glass down on the small folding table beside the chair. A couple of female dogs, an Afghan hound and a Dalmatian, were sitting on either side of him and nuzzling his footpaws and shins. A phone rang was heard from the pack on the ground at the dock. “Dang it,” he said as he put a paw on the Dalmatian’s head, petting her a bit. “Could you get that for me, Babe?” he asked her. “Sure thing, Temno,” The Dalmatian replied in a sweet voice as she got up and ran over to the bag. She was back within a few seconds bringing the whole backpack. She took her seat beside the wolf again once he had taken it from her. Usually the other person that contacted him would have hung up by now but the phone was still ringing. Must be important, he replied as he took the satellite phone out and pressed the button on it to connect the call. A voice was yelling on the other end, frantic loud and discernible. “Gah,” he replied startled as he took the phone away from his sensitive ears. He covered the mouthpiece with his paw and grinned at the females. “Sorry Ladies, I’ve got to take this,” he replied as he stood up out of the chair and walked over to the dock, the sun casting a long shadow back toward his seat as it lay just above the horizon. The wolf put the ear piece back up to his head and growled into it. “This better be important,” he replied…too late to realize his mistake. “S-Sir…” he replied as he recognized the voice as it cleared its throat on the other end of the phone line. “I’m sorry Sir, it won’t happen again,” he added as his tone changed to a much friendlier and slightly scared one. “What was it you were saying?” he asked politely before the voice started to yell at him again, he held the phone away from his ear and the expression on his face turned to one of shock before grinning nervously. He tugged on his collar with the index finger of the paw that wasn’t holding the phone as if it felt too tight all of a sudden. “He what?” he asked as if he didn’t believe what he heard. He thought for sure he’d broken Light’s spirit…that the wolf would give up after losing the one he cared so much about. A large part of the black wolf’s sudden change of plans relied on that. He stifled a swallow as he replied into the phone. He knew what fate awaited him if he didn’t remedy this situation. “Don’t worry sir, I’ll take care of it,” he said before hanging up and getting on the WaveRunner. The two female canines got up and walked over to him quickly, kicking up the sand with each step behind their footpaws. He started up the vehicle and pulled away from the dock speeding off quickly along the shore. Temno didn’t look back at the girls as they shouted at him, clearly enraged he’d left them there…based on the language they were using. He didn’t have a lot of time to waste though. It would take a while to travel back to Babylon Gardens and pick up Light’s trail…especially if he wanted to stay under the radar. Light looked around the squalor apartment and smiled as he looked back at Frank and Frankie. He finally had a chance to take a good look at the two of them. Frank, the Dachshund, looked similar to Lester in color, perhaps a bit taller and definitely with the physique of a civilian, leaving Light to wonder if he was in the military or not, although from the moves earlier in the van he must have been trained in something or other. The human in the room with the two canines, Frankie, looked to be about 55 or 60. He wore a yellow and red Hawaiian shirt that did little to cover up his partial beer-belly. A pair of jeans covered his legs and some comfortable sneakers were on his feet. His slightly leathery face showed his age as well as the graying hair and receding hairline. His mustache was well groomed and thick under his nose. Despite his aged appearance, his muscles were well maintained from what Light assumed used to be a long military career. He looked back at the apartment. “You weren’t kidding…it certainly is cozy,” Light said as he stifled a chuckle. The apartment was about the same size as the one Keith and Light had lived in prior to being hired to serve as security personnel at the shelter. The wolf thought back to the house and the stuff Keith had stored there that he could use. He wondered what will have happened to his former partner’s house and the possessions inside. He hadn’t bothered to ask Martin, figuring he would have known. At this point though it was far behind them and if they’d gone back there was the risk of getting caught so Light put it out of his mind. Frank and Frankie smiled as they led the wolf to a room in the back. The workshop was impressive. Light knew only a little bit about computers, but any system of this size and shininess would have certainly been useful. A server with several fans around it hummed beside a desk with 4 display screens set up in a 2x2 configuration, each with a different thing on them. One had several cameras on it along with the bottom two showing two different things, each looking something out of the television program 24. The last in the top right had a paused campaign of Elder Scrolls Oblivion on it. Light raised an eyebrow as he looked back at the man and canine and they whistled innocently as they put a hand and paw on each other’s neck as if caught red handed. The wolf’s attention was next brought to a workbench nearby had dozens of tools lying beside it, a mobile set of stairs beside it was assumed by Light to have been used by Frank to more easily access the work that they did. Light recognized several of the items to be homemade gadgets of some sort and was thinking the one that made the collar that allowed Frank to talk was one of them. He walked up to the work bench and reached over to pick up something that looked similar, as if it was a prototype. Light figured it would be okay to ask about the Dachshund’s condition. “Frank…what is this?” he asked, holding up the device. The Dachshund’s face lit up as if he couldn’t wait to explain to Light what it was. “Oh this…” his collar voiced as he walked up and took the device from the wolf before glancing at the wolf. He tossed it over his shoulder casually and Light heard a clunk as it hit the bottom of a wastebasket in the corner. “Garbage,” his collar replied as he looked back at Light. “A prototype of the device on my collar,” he added as Frankie took a seat at the computer station and started to bring up files on the Elder Scrolls: Oblivion screen. They were good sized monitors and the expensive looking systems were drawing Light’s attention from the one he was conversing with. He turned back to the smaller canine as he looked down at him and nodded. “What happened to your voice?” Light asked bluntly, figuring it couldn’t hurt to be so candid with someone that looked at him like an idol. Frank lowered his ears and looked to the ground and to the side as he stopped wagging his tail. “I don’t like to talk about it…but for you, of course,” the smaller canine replied as he walked over to a couch nearby and sat on it. Light stood nearby, not wanting to sit at the moment. He looked at the smaller canine and nodded, indicating for him to tell it as he wagged his tail anxiously. “Yeah but whatcha gonna do?” the smaller canine asked rhetorically as he walked over to another computer chair near the one Frankie was on and got to work, leaving the wolf to himself. “Not much I guess,” Light replied as he rubbed the back of his neck. He wondered if something like that happened to him if his new mate would do the same. “Light.” Frankie replied in his gruff voice as he spun the chair around to face the wolf. The wolf turned to face the man. “Yes sir?” he asked politely with a slightly nervous grin. “Do you have it?” he responded as he leaned back in the chair. “First door on the left,” Frank replied without looking away from the computer monitors. “Thanks,” Light replied over his shoulder as he turned and walked down the hall. A few moments later a queasy looking wolf returned to the computer work station from the bathroom. “Ugh…I hope I don’t have to do that again,” he replied as he held the flash drive in his paw. Thankfully the IronKey name had lived up to its reputation. The wolf had to cough up something with sharp corners and he had to be careful. That’s why it took a while but he returned when he had the flash drive in his paws covered in a gross layer of stomach and mouth fluids. He wiped it off on his fur. “You…but not so funny as…amusing,” Frank replied as he hopped off the couch after setting the laptop aside. He held out a paw as the wolf placed the flash drive into it. “You don’t hold back when you go about on a mission, do you?” he added with a nudge to which Light blushed slightly and chuckled. “No I suppose not.” Light replied before following the Dachshund into the room with the computer systems hooked up. The wolf nodded as he input the password from earlier. The IronKey drive's folder opened and Light handed the keyboard back to Frank and Frankie. "There's an encrypted file in there," Light explained to Frank as the smaller canine sat in the chair and interlaced his fingers before popping the joints in them as if a pianist about to play a piece. "Just leave that to me," his digital voice device said as he winked to the wolf. The Dachshund started up a program and Light wasn't sure what was going on but it looked and sounded like the computer system was having its work cut out for it as the fans kicked on and the processors were clicking. Light felt if there was any way to the files these two were the best chance he had. Light hadn't realized he hadn't had breakfast or lunch or much to eat last night. He was trying to suppress his stomach acids to prevent damage to the drive. "Oh thank you," the wolf replied as he accepted a cold burger that was left over from a fast food place Frankie had gotten out of the fridge. He quickly opened it and ate it ravenously. At this point anything tasted good and he was grateful for his hosts' hospitality. The wolf yawned after polishing off the meager meal, licking the cheese off the paper wrapping. "I'll take a spot on the living room floor if you have a blanket," he laid down and Frank was busy with decrypting the files so Frankie put a blanket over the wolf. "Thanks again Frank, Frankie," the wolf said quietly as he closed his eyes, still tense staying the night with the two individuals he'd never met before. He could usually sense intent in others from the heightened senses of his training and animal instinct unless someone was well trained like Temno. He stifled a growl as he clenched the blanket in his fists. "I'll find you," he promised to himself as he relaxed and slowly drifted off to sleep. "Think nothing of it, Light...it's the least we could do for Keith's partner," the man replied with a nod as he went back to his work on the work bench in the other room, leaving the wolf to his rest. Hmm, Frank is described as a bit taller than Lester but being a dachshund meant he has a longer body and shorter limbs. Wonder how would that be depicted. Other than that, good work that it's getting into gear for both party. I'd imagine Frank would look quite a bit like Lester since Lester is a dachshund...or so it is assumed by most. MMMmmm... this is getting good. but who are those people (bad people). this kind of evil anonymous org, always gets on my nerves. Hm. I wonder just who Temno's boss is. Sounds like a guy you don't want to be on the bad side of. Frank and Frankie are pretty cool. But I do get the feeling that both of them (and Temno) are just small parts of some massive conspiracy/conflict/whatever. Awesome update is awesome! As usual, great in every aspect. Nice! Temno knows how to take a vacation! His boss is Russian? Maybe? Is there at least a hope of come back? someday? something? what now what will happen with light? Last edited by legendario13 on Sun Apr 01, 2012 11:06 am, edited 1 time in total. this is bad news indeed! I just hope this is only a hiatus you're taking, Light. Good luck with your projects. Aww ... well, it was a good run. I can only hope that you'll come back to this when time is working more in your favor. Ok, while I haven't read this fic yet because I have too little time, doesn't anyone think that it's just a little strange Lightwolf anounced this on april fools day? X3 Now why would I try to do something like that? Light slept on the floor of the living room. For some reason not sleeping on a bed, like he had been doing at the shelter, felt nostalgic. He turned over and grumbled in his sleep. It had been a rough 24 hours. He whined and started kicking his feet before he opened his eyes and sat up quickly. The wolf looked around and remembered he was at Frank and Frankie’s place. He rubbed the bridge of his nose and his eyes as he groaned. “I’m still anxious…” he whispered to himself as he got up off the floor, wrapping his blanket over his shoulders and walking to the bathroom. Part of the blanket dragged on the floor and he quietly closed the door once he was inside. He looked at himself in the mirror. He lowered the blanket and saw that he still had the bandages on his shoulder from where he’d dug out the tracking chip the shelter assigned to its residents. What am I doing? He shrugged the shoulder before moving his arm in a circle, testing the pain of the injury he’d caused himself. “Should be okay…” he said to himself quietly but not as quiet as the whisper before. The wolf started undoing the bandage and bundled it up on the counter beside the sink. Frank and Frankie said they had something they needed to show him in the morning before he had gone to sleep. He had a suspicion it had to do with the file on the flash drive. His mind started wandering as it usually did when he was idle without much to do. Questions started forming. Was Keith right in trusting these two to help him. In the videos he’d explained that he’d known this Frankie guy for a while… but can Frank be trusted? The dachshund seemed to be really close to his human partner but Light wasn’t sure how close Keith had been to him. That dog seems fairly young. No telling how long Keith had laid out the plans involving these two…he did mention there were two contacts though and these must be them. I’m probably overthinking this… The wolf realized he’d been thinking out loud to himself and mumbled as he splashed some water on his face. “I need more sleep,” the wolf whispered as he pulled the blanket off the ground behind him and wrapped it around himself again. He left the bathroom and curled up under his blanket on the living room carpet again. I’ll talk to them about it in the morning. The black-furred wolf blew warm air into his paws and rubbed them together, being sure not to make a sound. Temno couldn’t believe his luck. He’d managed to stow away on a ship that was making its back to the states, in such a short amount of time. He’d been caught by the crew but promised he’d pay his way by working as a deckhand. The work came easy to him, due to his strength and training. He could pass as the captain if need be. For now he just didn’t want them asking any questions about him and just try to keep a low profile. He’d disappear as soon as they hit land. An announcement over the PA system of the ship started off with the familiar sound of the captain’s whistle. “Attention all hands, the ship will be diverting course to pick up a VIP, details cannot be given at this time, that is all,” was all the speaker overhead said before the feed cut out and Temno looked around. The few other crew members nearby the wolf looked at each other. A couple of them scratched their heads and shrugged before getting back to work. Temno determined it wasn’t all that unusual for something like this to happen and continued moving sacks of potatoes to the galley. It wasn’t the most prestigious work position on the ship, but at least others were leaving him alone. His cellphone he kept safely stowed in a crummy looking collar he’d purchased off the streets in the port the ship had been harbored in. He looked like any other runaway stray, if it wasn’t for his wolf-like appearance. “Hey, Dog,” the chef said to him as he brought the last sack of potatoes. The chef looked like a fat, greasy Hispanic man…he didn’t look like the rest of the population in the area of the harbor that Temno had seen. He had a thin mustache and dark eyes that lacked the motivation and drive that a chef should have had. The wolf looked at the man but didn’t say anything. He spoke very little, even when asked questions. After the first few hours of the silent treatment, the crew generally stopped talking to him, thinking him either dumb or someone that didn't care what was said to him. The ship’s chef tossed Temno a small bit of scraps left over from dinner on the floor beside him. The wolf looked down at the scraps before clenching his fists and looking back at him coldly. It was a vast difference from the quality of food he usually feasted upon. He walked away without looking back at the food. The chef glared at the back of the wolf’s head before going back to the inventory of the kitchen. “Dumb lobo,” he said under his breath. The wolf stopped and stifled a growl. He didn’t want to cause trouble because he knew they’d try to throw him overboard. He’d heard rumors from the other crewmembers that they’d done just that and didn’t want to risk it. He could kill most of them while they slept, but he couldn’t navigate a ship alone. He continued walking back to his quarters to rest. He’d been working the last seven hours and it was nearly 0400 hours EST. He hopped onto his bed and opened the porthole nearby. His collar started to vibrate and he pulled out the phone. He’d received a text from his boss, the one that had called him nearly 20 hours ago. He gulped and opened it to read. VIP contains information you may need. He is an ally and must be kept alive. We’ll continue monitoring your progress. Keep up the good work. A cinis, nos surgere. “A cinis, nos surgere.” Temno replied in a whisper in response before putting his phone away. He turned to the side and closed his eyes to get a few hours of sleep before continuing his work. Later that morning, Light awoke to the sound and scent of bacon sizzling in the pan. “Oh wow,” he inhaled the air deeply as he opened his eyes. He hadn’t experienced the sensation like that in what seemed like years. He hopped out from under the blanket and looked over to the kitchen. Frankie was frying bacon with a pan filled with fluffy scrambled eggs and pancakes, the perfect breakfast. It wasn’t just the style of cooking. Light had the same breakfast many times at the Grove…but he hadn’t gotten to hear or smell the bacon as it was cooked. It was euphoric. He sat at the table and grinned eagerly as his tail wagged. Frank was already sitting at the table and reading an article of the local tabloids. “Bet you’re eager to get to those files on the drive you weren’t able to open before,” Frankie asked as he brought over a batch of pancakes to the table. Light nodded as he stuffed an entire pancake into his muzzle after dousing it in syrup. “Mryah,” he replied with his mouth full. “In a little bit, I’ll explain the plan we came up with,” Frank replied from his collar’s voice box. Light looked nervous, but it was expected due to what his new friends were about to do to him. “I hope this works…I don’t want to be a puppet to anyone,” the wolf replied with a slight whine as Frankie double checked the bindings and Frank sat at the computer and opened up the folder of MP3s. The wolf was amazed that Keith would have entrusted these two with the password to anything. If his partner had trusted them though, Light certainly would…he didn’t have a choice. They were the only ones that he felt he could trust that had the skills he needed. The LCGSD forces didn’t count…not anymore…not since he felt he had betrayed them. “So how does this work?” Light asked the dachshund as he tested the bindings on his wrists and ankles. Frank didn’t reply but started up the program he had developed with the help of Frankie under the request of Keith and accessed the files that had been locked within the drive, the ones deemed too dangerous for Light to listen without seeking the help of these two. The first audio file played and called out the sequence of numbers to activate the audio commanded brainwashing. The wolf’s eyes started to glaze over and he relaxed on the table he was strapped to. The next command was spoken in the voice of Keith on the computer which was the command to kill; the next voice being that of Frankie adding the name of the intended target. “Frankie” he called out. It only made sense to test it on someone in the immediate vicinity and Frankie wasn’t about to sacrifice his beloved canine companion for the sake of a test. There was a short pause of a few seconds before Light started to writhe and pull against the bindings strapping him to the table as he growled and his eyes turned cold and malicious along with the scowl on his face. The wolf was struggling to the point of not caring whether he harmed himself in trying to escape. He was going to be bruised from hitting himself against the table, not seeming to care about his own safety. After a few minutes Frank and Frankie recovered from shock and realized it had gone far enough. Frank pulled up the MP3 file that had the abort command, the voice of Keith once again sounding over the speaker. Light was panting as he came back to his senses and relaxed against the table, exhausted as he shook his head. “What happened?…ow…my head,” he said as he opened his now normal looking green eyes, the glazing over having disappeared. Light whined slightly as he looked at his wrists where the straps had rubbed them quite a bit in his attempt to escape. “So…what was I trying to do?” he asked, oblivious to the whole event while under the hypnotic like spell. Frank and Frankie looked at each other before Frankie lifted his chin to the smaller canine with a ‘go ahead’ gesture. The dachshund saluted and started up the MP3 file sequence again. “Let’s hope this works,” Light said to them before dropping out of his conscious and willing state once again. Last edited by lightwolf21 on Tue Apr 03, 2012 1:14 am, edited 2 times in total. Interesting... but how will light control the unconscious state in wich he falls every time they use a command? Yeah it looks like you had a great time playing that on us... maybe tomorrow i'll laugh, but not today. *slaps the wolf* BAD! I was upset, genuinely upset when I read that prank! Poor Light, I hope he gets over it, or they can at least inlay a bypass system for him to be able to reject commands if need be. I hope you continue this for a while yet! One of the best in the forums! Also, holy carp, Light is like a Soviet sleeper agent or something. Geez. They'd best be sure that those codes don't fall into the wrong hands. It was the next day and another early, quiet morning. Emily hadn’t been able to sleep well since her mate, Light, had left the shelter. Even though it had only been a few days, she hadn’t slept all weekend because of her anxiety. The taupe-furred female started doubting she was even good enough for Light, even after the encouraging words from Martin. She stumbled and caught herself with her paw against the side of the book shelf, dropping the book she was carrying. She didn’t answer because she was asleep, breathing regularly as he supporter her. He didn’t want to shake her awake since he knew this was the first amount of sleep she’d gotten. He gently lowered her to the ground and sat beside her, sitting with his back against the bookshelf and supporting himself up with his paws flat on the ground. The canine’s dreams seemed troubled however and she moved her paw a few inches and grasped the raccoon’s fingers with her own and stifled a whine, squeezing his paw slightly as her footpaws moved of their own accord. Mike gently squeezed back while blushing. His heart was pounding. He still had feelings for her after all even after Light’s warning. He had tried his best to follow Light’s wishes…to protect the wolf’s mate. It just hurt so much to have to do it when he loved her so much. He sighed and leaned over slightly to move his paw more into her paw, interlacing the fingers. There…no harm in that. he thought to himself before swallowing nervously and blushing. Mike sat there beside her, waiting for her to wake up. He decided was going to be there for her just like he promised the wolf…he didn’t care if she reciprocated the feelings or not. He blinked his eye and a tear ran down his face and landed atop Emily’s forehead causing her to flinch but just shifted a little, still deep asleep. “Sleep well, my hopeless love,” the raccoon whispered as he looked down at her before reaching over and gently stroking her headfur back with the closer paw to her that she was grasping. It was noon of that day and the skies were blackened by storm clouds. An occasional flash of lightning lit the rolling waves of the furious seas for miles in every direction for a brief second. The resilient Caribbean Sea-faring ship that the black-furred wolf had stowed away on to make his way back to the States was caught in a storm. Rain battered the ship as it rolled on waves. The chopping of air of the massive rotor of a Ka-60K Kasatka hovering overhead overtook the crashing of waves against the side of the ship. Even the whistling of the strong winds that whipped the raindrops back and forth along the deck of the ship couldn’t be heard over the noise. The organization wouldn’t be hindered in their schedules for anything however, and a rope was lowered to the deck. Temno stood by and kept on eye on some of the crew, a few of them that held AK-47s and stood around the captain. Looks of apprehension showing on their faces didn’t help to calm their nerves. This was a highly unorthodox maneuver and even more unusual to have unannounced passengers drop by on their ship. They were glaring at the wolf, thinking he had brought them bad luck. A lone individual carrying a briefcase attached to the harness on his jumpsuit slid down the rope to the deck of the ship. He landed roughly with his combat boots making a splash in a puddle nearby before detaching his harness clip from the rope and activated his radio clipped to the opposite side of the belt as his briefcase. The crew could barely hear him, having stood 20 yards away. Temno made it out though. A mere confirmation he was on the deck. The pilot retracted the rope as the winch brought it back up into the helicopter before it took off in a westerly direction. The VIP looked to Temno and waited for the wolf to translate. “Он говорит, что приветствие незнакомца, мне сказали, чтобы разместить вас до следующего порта, а не задавать вопросы, и что нужно платить за наше сотрудничество итишина ... Я надеюсь, что это не ложь,” When the wolf was done the man smiled and opened the briefcase to show the men. It was full of stacks of hundred dollar bills and an envelope. “Есть ли у нас соглашение?” he asked. Temno looked to the captain. “Do we have an accord?” he translated again. The captain and his crew members finally regained their composure. They’d never seen that much money…nor would they most likely ever again. “Yes of course,” the captain replied with a grin and nod. “Конечно, это только четверть суммы ... не хочу, чтобы вы меня двойное пересечение.” the unnamed man added with a smirk, eliciting a chuckle from Temno. The wolf looked back at the several crew members and captain after they looked at him with a confused expression. “What’s so funny?” one of them asked. A couple of the crew members looked at each other with a grim expression as if a scheme of theirs just failed. The captain nodded with greedy eyes and called for the man and wolf to follow him. One thing that the VIP didn’t have going for him was his neglect on learning the English language. Temno rolled his eyes and cupped his paws over his muzzle and translated for the unnamed man to the captain. “Of course, Señor,” I’ll set you up in a meeting room in private. Temno started to translate the last statement just as the door closed behind them, shutting out the storm. Temno sat at a table across from the mysterious member of what he assumed was the same organization. Sometimes you never knew who was helping you. Could have been your own organization or one you just happened to subcontract work out to. The wolf was looking around with a warm smile, his usual tactic of putting those he met at ease. Only those that truly knew the wolf knew beneath that insincere smile laid the cold-blooded psychopath with secret agent like training. The man was dressed in a gray suit, white dress shirt and blue across the small two person table from him cleared his throat. Temno could only assume he had been wearing it under the jumpsuit from when he’d boarded the ship. He hadn’t been given the name of the man and the man hadn’t told him. It was common in the organization to keep anonymity. The VIP was having trouble figuring out the wolf that sat before him. His breaking of the awkward silence elicited Temno’s attention. “Вот документы.” he said in Russian once the wolf was looking at him. The wolf didn’t say anything but took the envelope. The VIP stood up from the table and nodded to his contact, indicating he understood the exchange was done. He turned and walked away. He was hoping not to have to see the wolf again. He found him unsettling. He would have to make sure he disembarked at the ship’s next stop. He nodded in acknowledgement to one of the crew members guarding the room. They were armed with AK-47s and keeping a watchful eye down the corridors. They didn’t exchange pleasantries as they just stood by waiting for the wolf to finish what he was doing inside. After his contact had left, Temno looked around and didn’t see anyone around since the Captain had been told to give the two of them privacy. The VIP had paid the captain to make sure the crew kept guard outside the room. The organization took no chances. The wolf opened the envelope and carefully but quickly read the contents making sure to absorb all of the information. It was Light’s dossier including those of suspected accomplices and friends. There were quite a few documents on him. The organization had done its research on its enemies. The black-furred wolf grinned and lit himself up a cigar he had in his collar. He slowly puffed it, the eerie red glow lighting up the side of his face as he puffed the smoke out of his nostril and onto the photo of his white-furred brother. Smoking was really his only guilty pleasure and with his expensive tastes he liked to savor it. “Nothing personal, Brother,” he said with a grin. 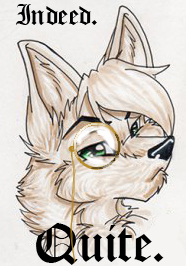 “…just business.” The black-furred wolf took the cigar out of his muzzle and pressed it against the photo after he had finished memorizing all of the information on the wolf. The paper was slowly burning out away from the center of it, slowly consuming the white wolf’s presence in print. He chuckled as he slowly watched the entire thing burn on the table, picking it up and placing it in a trashcan nearby. He waited until the entire thing was blackened, slowly enjoying his cigar while it happened, finally he spread the ashen remains of the documents while putting out his cigar in the waste bin. After he was satisfied with having destroyed the evidence he left the room and casually waved a paw to the guards as he left for his room for the night. "About time I had a challenge," he whispered to himself with a grin. Temno was going to look forward to facing his brother again. Disclaimer: As you might have guessed from the dates, this arc is taking place prior to Valerio's current arc by a week or two, depending. Who wants to guess the name of this unnamed organization for a chance at an art piece drawn by yours truly? ;3 Send your guesses via PM. One guess per person please. I love some baddy action from time to time. it makes for a better cast. So is more complicated than i thought. Ooh ... I like Temno in the same way I liked Darth Vader: he's a good villain. Looking forward to seeing more! As for the name of the organization, I'll have to give it some thought ... are there any clues in the story so far? Yes there is a clue. X3 That's all I'll say about that. Being mysterious like a sir. Nice update! Always love a good villain. Seems poor Emily is distraught. I hope she feels better. Light has gotten himself into a mess now. The sun rose later in the day, the winter season slowly marching toward spring as the wolf stirred in his sleep. Light winced as his wrists, ankles and waist rubbed against the floor of the carpet. He curled up in response and whined as he gently rubbed his wrists. The fur was badly damaged where the restraints had been rubbing as was the skin just under it. The bindings they’d been using were soft leather but it helped little, considering the shear amount of time he’d spent strapped to that table. He knew they didn’t have much time so he’d begged Frank and Frankie to repeat the exercises over and over again, 15 minute intervals with 3 minute rest periods to begin with over the course of 14 hours. After three days, the violent bursts of energy taking their toll on the wolf. He grumbled as he brought in his knees to his chest and rubbed his ankles. “There’s barely been any improvement…how long do I have to stay here?” he asked quietly to himself. Frank was about to answer when Frankie walked in with a couple of bowls of oatmeal and set them on the couch and on the floor beside light, grunting with the effort at bending down so low. His body in its state seemed to be showing its age. “Oatmeal today, boys…ran out of groceries too quickly with the way you eat, Light,” he said with a chuckle before heading to the computer room. Light held back tears as the dachshund moved to get close to give him a hug. The wolf held up a paw. “I’m okay…” he said with a nod. Frank nodded and sat on the carpet beside him. “Emily?” Frank replied with a wagging tail as he gave a mischievous expression to the wolf. Light ignored him and waved a paw dismissively in his direction. “How did they know about the shelter?...even more important, they would have killed me if I knew what Keith knew…unless they know I don’t know for some reason,” the wolf continued on in his thinking out loud, talking softly to the point Frank was almost having trouble hearing him. When it seemed like the wolf was having trouble and he puts his paws on his head and shaking it, Frank approached him from the side. “Light?” he asked just before the wolf grabbed his neck with his paw and lifted him off the ground and slammed him against the wall. The wolf was panting heavily and his eyes looked at Frank coldly. The dachshund grasped at the wolf’s much stronger paws and tried gasping for air. Frankie came into the room at the sound of the banging of Frank’s body against the wall. “Light!” he shouted before Light’s expression instantly turned from one of emotionless rage to one of fear as he released the smaller dog and continued panting heavily. He shook his head and stumbled a bit before supporting himself against the wall. Frankie rushed over to Frank and checked on him. The dachshund was shaking his head and gasping for breath. “I’m okay I’m okay,” the voicebox around his collar made out as he mouthed the words. Light looked from the man to the smaller dog that he’d just tried to strangle and back to the man before growling. “I’m a danger to you two…there’s no improvement over this stupid thing and I’ve spent more than a week here,” he was starting to get more upset. Why do they still want to help? I almost killed Frank. The only one that had this level of understanding was Keith, or so the wolf thought. Martin had also exhibited an almost surreal level of compassion when it came to animals, perhaps Light had yet to learn there were others in the world that were also capable of immense levels of patience and understanding. He shook his head and sighed as he lowered his arms to his side in defeat. “You feel you’re honor bound to make sure to cure me of this because of Keith, aren’t you?” the wolf asked quietly as he looked down and to the side. “No, Light,” Frank replied as he approached and put a paw on the wolf’s shoulder, having to reach up a bit to do so. “We’re doing this because we’re you’re friends and comrades,” the digitally altered voice sounded almost canine like to the wolf’s ears…not its slightly cold and mechanical sound. Frank looked up and over his shoulder at Frankie. The human nodded and the canine turned back toward Light. “We haven’t been able to find anything on our usual message boards or through contacts,” he said as he rubbed the back of his neck while looking at the wolf. Light just looked at him and smiled. “You know there are other ways…” he said with a mischievous grin. “Field work,” he concluded as he opened the door and walked out of the apartment. The human rushed to get a jacket before closing the door behind them as they left the apartment and walked out onto the streets. Light had been trained by Keith to be a profiler, able to pick out those in a crowd that didn’t belong. While most of the time it wasn’t an easy thing to do and many times it wasn’t worth it, Light was feeling lucky…either that or desperate. He walked the streets of the town until he started down an alleyway that was giving him a bad vibe. He looked around before slipping into a dumpster and rolling around in the garbage. He plugged his nose…it had been a while since he’d had the urge to get as filthy as this…and he was remembering why. “Ugh…” he whispered to himself as he looked around to make sure no one was watching as he got out. He continued down the alleyway and looked behing him at the van where Frank and Frankie were monitoring his progress. The wolf put a paw to his ear and pressed on the microphone receiver hidden in the canal. “Can you read me, Hot Dog?” he whispered before taking his finger out and waited for a reply while continuing down the alleyway into the heavier shadows of the taller buildings. “Loud and clear, Wolf,” Frank replied with a grin as he handed the binoculars to Frankie. The human looked down the alleyway at Light who flashed them a thumbs up as he looked for some thuggish strays. The wolf hid his nervous grin as he approached one of the larger felines digging in a trash can. He tapped him on the shoulder. “Hey, where can a guy get a bite to eat around here?” he asked. The cat turned and grinned as several other large felines appeared behind Light. Light glanced over his shoulders one at a time and whistled, feigning being impressed. “So it’s true, the strong do survive,” he said with a grin as he looked at the largest one he tapped on the shoulder. “Why the need for food, Kitties? Master’s not giving you any?” he asked in a taunting voice. The mangy looking ;tabby with dirty orange fur and a bite out of his ear jumped at Light in a pounce motion. The wolf sidestepped him and swung his footpaw over his head in a downward crescent that caught him in the back of the head, causing Chico, a gray and white blotchy coat, to lower his ears in the split second he had to react before getting landed on by the pouncing cat. Light grinned with a playful growl as he looked at a third cat carrying a lead pipe. His ear flicked toward a fourth assailant with a heavy short chain. The wolf reacted just quickly enough to dodge it, the metal chain brushing up against his headfur as his head moved out of its path. Light turned to face the chain-wielding cat, giving the reddish furred one a chance to hop on the wolf’s back and put the pipe over his neck and pulling on the ends of it, trying to choke him. The larger wolf lurched forward suddenly and while grabbing the scruff of his neck tossed him into the pale orange cat brandishing the chain. They meowed in pain as they landed on the ground atop one another. Light was not amused at the use of weapons. He didn’t see it as sporting although he did appreciate the challenge, a little forewarning would have been appreciated. He wasn’t as amused as before, showing it in a growl toward the apparent leader of this particular gang, the larger cat he approached earlier. “You guys call yourselves alley cats?” the wolf said with a growl, a grin showing on his face. “You make Max look almost good as me,” he said with an air of arrogance. The leader cat, a black furred, brown-eyed large, muscled feline gulped again and nodded. “Y-Yeah…of course, what do you need?” he asked as he offered a good piece of food from the garbage to him. “You wanted food, right?” he asked with a warm smile. Light knocked the food out of his paws and intimidatingly picked him up by the fur around his shoulders and lifted him roughly against the side of the garbage can. “No. Information,” he said coldly as the four cats that attacked him earlier lowered their ears and cowered at seeing their leader being handled so violently. They knew now the canine wasn’t to be trifled with. Light nodded in understanding. He didn’t need to use force since he felt these cats could be reasoned with. He set down the leader and crossed his arms as he looked down at him. “I need help…I’m looking for information on a shady organization…only thing is no one knows what they’re called or anything about them. I was hoping to try some smaller groups to see if anyone’s heard of anything,” the wolf explained as he kept ready for an attack from any of the five cats. “This organization deals with using animals for nefarious purposes,” Light elaborated as he covered a nostril and turned his head to blow a booger out of it, really playing up his character. “Well, I’m hardly able to help out a complete stranger,” the cat said with a grin as he swished his tail back and forth. Light thought he could make out some scars near the tip of it. The wolf rolled his eyes and sighed. “I’m Kevin,” Light said without hesitation. “Richard,” the cat replied holding out a paw. Light’s ears perked up at the name. “Yes…actually…” he replied with a slightly surprised expression on his face. “…I’d heard they disbanded though…” he added, suddenly becoming very interested. “Yeah,” Light interrupted. “They never found the leader,” he replied with a focused expression. The leader of the small band of cats raised an eyebrow. “Someone is well informed,” he said with a mischievous smile on his short feline muzzle, his tail darting back and forth playfully. He was showing interest in this canine. “A friend of mine had a run in with the group before,” the wolf replied. “My condolences,” Richard replied with a slow head shake and disheartened look. “Condolences for what?” Light asked with a confused expression on his face. “Your friend…if they had a run in…wait…don’t tell me they survived?” the cat asked with a shocked surprise on his face. The leader cat’s jaw was still dropped, his maw open as he was trying to figure out this mysterious canine. He seemed far more than he was letting on. “Who are you, really?” the feline asked as he shook his head and leered at the wolf. The wolf nodded with a sincere expression on his face. “I won’t crack if they torture me,” he replied. The cat chuckled and put a paw on his shoulder. “Somehow I doubt they could get you to break,” he said before the wolf glaring at his paw caused him to remove it promptly. He cleared his throat. “Ah yes,” he whispered the location in the wolf’s ear. Light nodded and roughly clasped a paw on the bicep in appreciation. “Thanks, Richard,” he said as he nodded to the other cats that were no longer looking at the wolf with fear but still in a respectful manner. “Good luck, Dog,” one of them said as Light turned to leave. Temno had finally made it to the states. It had taken quite a bit longer than anticipated…but the information he had would make sure things went smoothly. “Now…where are you, brother?” he asked himself with a grin. The ability to act like his target, the similar background and species along with similar DNA allowed him the advantage of anyone else in the organization and he knew his superiors knew that. They would allow him some leeway but even they had standards they had to uphold and therefore he couldn’t afford to waste much time. The one thing Temno hadn’t anticipated was his target and his target’s comrades travelling past the black-furred wolf on their way into Mexico while he was busy entering the States. Light was looking pretty bad. He could tell the back of his head was bleeding and the canines accompanying him had only given him minor medical attention. It wasn’t anything he hadn’t been able to survive before. The last few days’ planning had fallen apart. While he’d made slight progress in resisting the effects of the brainwashing that held control over him, he couldn’t wait too long before finding the location of the trail they were on. The wolf’s team, consisting of just himself the human and the dachshund, had gotten careless with moving too soon and without inadequate planning and now he was captured and he didn’t even know if his comrades were still alive. Apparently the Fanged Teeth monitored activity in their area more closely than they’d anticipated. The last thing Light had seen was the RPG that was traveling toward their Humvee and he pieced together the other events in his mind while being transported by ATV, a less than comfortable experience. The explosive had struck the ground beneath their rental vehicle on a cliff-side road just before they’d entered the city, ejecting the wolf from it. He saw the human and canine remain in the truck as it went over the cliff before he’d hit his head and blacked out. The wolf was unconscious while they started to move him. Who they were he could not be sure at the moment. He was kept blindfolded and his paws were bound while they moved him. Luckily they hadn’t noticed the earpiece he had in his ear canal. He could still feel it snuggly tucked away in there. His captors were canines as far as Light could tell from their scent, sniffing the air as he slowly regained consciousness. He also noticed he had traveled a ways by ATV. His paws tied to the frame of a flatbed of some sort. Light was thrown to the ground and his blindfold was removed while he was pinned. He struggled as the canines that were accompanying him backed away and allowed the wolf to get to his knees, his paws still bound behind him and his footpaws tied to one another wouldn’t allow him to get to his feet and keep his balance…not with the ringing in his ears that still persisted. The wolf looked up in front of him and saw a canine with a metal paw to the wrist. He’d never seen something like out of Star Wars in real life before. He could tell with the way the others were looking at them he was their leader. Light was the first to speak. “Who-“ He was interrupted by the leader of the Fanged Teeth ‘s metal paw backhanding him across the muzzle, eliciting a yelp from the wolf. He stifled it and the yelp ended up coming out more like a grunt. “And who gave the order to fire an RPG at said vehicle?” the dark brown dog with red-colored eyes asked as he put his paws behind his back and walked up to the canine that had answered; a red and white husky with no discernible markings. The husky gulped. “Um…no…one…sir…” he managed to say before the metal-clawed canine shot out his paw faster than the husky could react and clamped the contraption around the dog’s neck. “Hrk,” he cried out and tried to yell but all that would come out were whines. He brought the dog closer to his face and whispered in his ear. The husky didn’t stop struggling until he became frozen with fear at what he heard. Light could barely make it out but it sounded like having to set an example for those that undermined his authority. The white-furred wolf looked away as he heard a yip and the sound of a body hitting the ground. When he looked back the husky wasn’t moving and the metal-clawed dog made a sweeping motion out away from his chest and a couple of canines standing nearby carried the limp figure out. He turned back toward the wolf and grinned with his long tongue sticking out. “So hard to find good help these days…as for you…” he leaned over the wolf on its knees. “I am Fang, leader of the Fanged Teeth…and you don’t look like an ordinary wolf…what business do you have here?” He opened his clawed paw and grasped at the scruff of Light’s neck, lifting him off the ground, exerting some effort to do so for wolf was larger than him. “Answer quickly so that I may kill you…I do have some patience after all, I’m not going to off you until I have learned who else might know of our location…looking at you I can tell you’re ex-military…oh yes, from a simple glance…so I’ll ask you again…what are you doing here?” He couldn’t let their plans become compromised. They had put in too much effort and planning to let a lone wolf ruin it now. They were just several days away from a kidnapping that would bring some very powerful enemies of theirs to their knees. Fang raised an eyebrow and continued staring down at the wolf with his unsettling red-eyed gaze. “Intriguing…you come here for business. What type of business then? You don’t appear to have anything of value for me so perhaps you mean to trade information. He lifted the wolf and pressed his nose and growled threateningly at Light. “Do you take me for a fool, Mutt? Do you not see the organization I’ve rebuilt from scratch? We are well informed in most matters involving the underworld and black market operations involving pets and dealings.” He let go of Light and the wolf fell forward onto the floor. “I’m insulted to think you have anything for me worth bargaining for your life with.” He added as he turned around and kicked the wolf’s side, causing him to roll over onto his back. Fang stopped suddenly mid swing of his next kick. “Weapons, Hmm?” he raised the same eyebrow again and licked his chops with a long canine tongue. “Since you don’t have them on you, they must be in the Humvee. You!...” He said as he pointed to the other canine that had brought Light in. The Golden Retriever-mix lowered his ears and stifled a whine as he swallowed nervously. Fang growled at the mention of it, still not having forgiven the other one despite delivering a final discipline to him. “It just knocked the vehicle off the road and tore open a large hole in the rear passenger side…that’s all I was able to see before I lost sight of it,” the Golden Retriever-mix replied as he consciously stopped his knees from knocking together in fear. Fang walked over to a table nearby with an impressive spread and helped himself to a few slices of meat and placing them on a ceramic plate he’d picked up. The only indication he was listening to the wolf was a reply, otherwise pretending his guest wasn’t there. “Oh…there are plenty of those…the stuff I know about would make your fur crawl,” he said casually with a grin. Light rolled over onto his side and looked over at the back of the canine with a metal paw picking at food items and placing them on his plate. “I’m looking for a place that performs brainwashing on feral animals and has possible connections to Russian military forces,” the wolf added, hoping it would narrow it down. Fang stopped suddenly as he was about to put a bite of filet mignon in his maw and dropped it…at the same time as the plate. The food on it and shattered pieces of plate spread out on the ground at the dogs feet. A collective gasp came from the various groups that were congregating in the room. Many of them appeared busy with various tasks and they all suddenly stopped and looked at Fang. The wolf could visibly see Fang’s fur on his neck stand up on end. Jackpot! he thought to himself as he grinned inwardly. “You wants me to take care of ‘ims, Boss?” the Doberman asked with a sadistic smile as he cracked his knuckles. The Doberman nodded and easily lifted Light over his shoulder. For being slightly smaller than the wolf, Light could tell the smaller canine could nearly match him in strength. Fang looked around the room and growled. “Back to work. All of you.” He commanded as the rest of the minions went back to their tasks. Light was tossed onto a table with a set of several rusted knives and other bladed tools beside it. It looked like they didn’t like to waste water cleaning pointless things. “Oh a table…how original…” The wolf said in a less-than-amused tone as Ted strapped him down. It has a name? No no…don’t jump to conclusions…it might not be the same organization. Light maintained his stoic facial expression, trying his best not to give anything away. He noticed this Fanged Teeth leader, Fang, seemed to hesitate just before he said the name. He was good at hiding the fear in his face, having not made the same mistake as before the first time Light had mentioned it. “I don’t know what you’re talking about. What’s Fenice Nera?” Light asked sincerely, hoping Fang wouldn’t think he was lying…since he wasn’t. Light had never heard of the name…or at least had no recollection of it. The wolf was sure Fang had tortured many before and would eventually be satisfied with his answers, but he wanted to avoid that if possible. “You seem genuinely afraid of this organization…” Why can’t I keep my muzzle shut? “There will be no deal. You will tell me what I want to know and I will take your weapons you brought as bargaining chips and use them to kill you,” he paused as he grinned and licked his chops slowly as if anxious to taste the blood of this wolf that was so arrogant. “An ironic end, wouldn’t you SAY! ?” he added as he stabbed the knife into the table on the last word beside the wolf’s head to emphasize the point. “Yes, if it is the same organization of which you speak, I do not want any more dealings with them, although I do want to destroy them,” Fang replied with an eye twitch. “For now?” Light asked with a sly grin. “I can’t have you surviving since you’ve learned so much about us,” Fang replied with an unsettling smile. “You will destroy this organization or die trying…” he added as he took out a heavy steel collar that looked much too big and slipped it around the wolf’s neck before locking it in place. “For reassurance…if you so much as think about double crossing me or refuse to accomplish this mission,” he grinned as he pulled out a smart phone and showed the wolf a video of the collar the wolf now wore being demonstrated on another of his test subjects. Light didn’t like what he saw…but it drove the point home. He didn’t want to end up with the collar exploding while it was around his neck. The mutt relaxed a bit. “The retrieval team found the vehicle balanced on a large tree coming out of the side of the back road cliff 15 meters below the road. We would have tried to salvage the vehicle but the huge amounts of smoke pouring out from the engine told us it was beyond repair. One member of the team spotted a couple of bodies 300 meters below the vehicle. They must have tried climbing out and fell. After extracting the weapons the team performed cleanup and rigged the vehicle with a small charge, causing it to fall below. Accidents happen all the time on that road.” He added with a grin. “Excellent. Now bring me the weapons and that tactical officer I requested,” Fang commanded. The mutt nodded and saluted once again. “As you wish, Sir,” he replied before leaving the room, locking the door from the other side as he did. Light kept his expression relaxed, despite the exploding collar around his neck. Inside he was torn up. How was he going to continue this mission all by himself and such close friends of his Father losing their lives to help him…it would take a while to wipe that from his conscious. Light put aside his personal feelings for the moment. Maybe it wasn’t hopeless after all. Any help would be useful at this moment. He was about to ask what he would need with someone like that if he had the collar when a knock at the door interrupted his thoughts. “Come in,” Fang said without hesitation. The door was opened just as quickly and in came a female cheetah. At least Light thought it was female. It was so difficult to tell from first look sometimes. The voice confirmed his suspicions. “Cameron Winter reporting for duty, Sir,” she said with a salute before relaxing a little. “Yes, you’ll do. Come here,” he instructed and she walked up to him and looked at the wolf strapped down at the table. She looked nervous and Light was picking up on it. It seemed she wasn’t used to seeing this sort of thing. As she was now closer the wolf could make out more of her details. She had strange colored fur for a cheetah, nearly black with the only parts more darkly colored being her spots. Light had also never seen pets with so many ear piercings, although that’s not to say he had kept up with the feral styles. It was a bit strange to see the tip of her headfur dyed a dark green as well as if she was wearing highlights. Her eyes were a light blue, not having much color to them but cool and unique. Her tail swished back and forth in interest. She looked to be shorter than Light, about the same height as Fang. “This is one of my tacticians to accompany you. Seeing as how one of my guards killed your comrades, please take this to use in your mission as you see fit,” Fang explained as he held a paw out toward Cameron. “What? !” she exclaimed before a glare from Fang caused her to mew and lower her ears. “Y-Yes, Sir…I’ll go get the usual traveling supplies together for myself and the wolf,” she replied as she turned toward Light, a slight bit of annoyance in her eyes. Light tried his best not to growl. He wasn’t sure if this guy was serious or not…if he treated all of his followers like objects or just the females, he didn’t like it. When she looked at him he could tell she wasn’t liking this arrangement. Who would like it?...being forced into something like this where the alternative was most likely death at the hand of your boss. The wolf nodded but said nothing to the canine before turning his head toward the feline. “Look forward to working with you,” he said politely. Why did it have to be a cat? he asked himself as he faked a smile. It wasn’t that the wolf disliked cats, far from it. He’d known many fine felines from the shelter and Babylon Gardens…but he hadn’t had much if any experience with working with them in the field unlike the largely canine composed team of the LCGSD. Cameron didn’t reply but just turned away in a huff and walked quickly out of the room in a determined fashion. As if wanting to getting away from the wolf as soon as possible. She nearly slammed the door behind her. “Indeed,” he replied before a knock at the door echoed off the stone walls of the room. “Sir, we have the weapons,” someone called out from the other side. Light flicked his ears in interest at what he just said. What does that mean? What’s he up to? Has he caught on? Questions were racing through the wolf’s mind as he kept a poker face up for defense. It was a few minutes before Cameron was led in by a couple guards. She was holding the apples like Fang had asked her to bring. “You just had to ask me to come, Fang. You didn’t need to sick goons on me.” The two canines looked at each other with raised eyebrows and looks of anger. “Leave us,” Fang commanded the guards and they left and closed the door, the sound of it locking it behind them creating another echo in the cavernous room. “Go stand over there against the wall,” he said as he gave Cameron an apple to hold in her paw. “Put the apple on your head when you’re there as for you,” he said as he looked at Light before unstrapping his bindings. “Get up and open this case,” he ordered as he pointed to one of the larger ones. The feline gulped and looked with pleading eyes to Fang, trying her best not to cry. She had an idea what he was going to do and she knew to disobey an order was a certain death. She decided to go with the less painful and uncertain choice as she slowly walked to the wall about 25 yards away and set the apple on her head, taking a deep breath and trying to stay perfectly still. Light had to stifle a growl and frown as he slowly got off the table, his headache was a little better, but he was still slightly dizzy as he turned to hang his footpaws over the side. He eyed the knife that Fang had been threatening him earlier beside him on the table but he knew he couldn’t get out of here…even by threatening to use their leader as a hostage; surely Fang had planned for such a contingency in addition to the collar he now wore. For now, he decided to play along. He lowered himself to the ground and walked slowly over to the case and opened it, putting in the key code for each one. They’d had to pull quite a few strings and contact some of Frank and Frankie’s friends to get weapons once they’d arrived in Mexico. Light just couldn’t let Fang know the truth about the weapons…at least not yet. The case opened with a click and Light stood back to let Fang look inside. Inside the case were two AK-47s with silencers placed off to the side for attachment and a couple of loaded magazines. Fang grinned as he picked up the weapon and mag and slammed it in the chamber. He seemed to know his way around guns. He handed it to the wolf, confident he wouldn’t try to shoot back at him. Fang looked at him disappointingly. “You’re no fun,” he replied. “If you won’t, then…” he added as he suddenly raised the gun and took aim at Cameron at the other end of the room. Cameron’s eyes remained calm and collected as she tried to move but inside she was too scared to do so. She felt like she was going to die and there was nothing she could do about it. As Fang raised the weapon toward her, she closed her eyes and waited. Light instinctively took the knife beside the table and threw it full force straight at Cameron’s head just as Fang was about to pull the trigger. One thing Light knew about firearms…correction…he knew everything about firearms. Keith had made sure of that. From the angle Light could see the trajectory of the bullet just as it was about to leave the barrel and knew it was going to miss the apple. He was just hoping he’d managed to make it in time. The wolf held his breath as the knife left his paw, the spinning blade traveled straight and true as it spun in the air. The bullet exploded forth from the barrel of the AK-47 with a deafening gunshot. The knife had traveled nearly 4/5 the distance as the bullet caught up with the knife, striking the spine of the blade and knocking it off course as the bullet changed directory a few inches upward and struck the apple atop the cheetah’s head, exploding it into applesauce before striking the wall behind her, embedding itself in the stone wall as the knife increased its radial velocity and bounced off the wall a few inches to the side of her head. Light breathed a sigh of relief as he got up from his followed-through pose. Fang’s jaw dropped open and looked at the wolf with a you’ve-gotta-be-kidding-me expression. The wolf returned the look with a glare before realizing who was holding the weapon and who was unarmed. “I said I don’t use firearms…let’s just leave it at that,” he said as he slowly took the weapon from the reddish and brown dog before placing it in the box. Cameron opened her eyes as she felt the pureed apple dripping down her face and neck, almost certain it was her own blood. She reached up with a paw and brought it away to see but was relieved to see it was just applesauce. She nearly passed out but caught herself on the wall. She was proving herself pretty tough. Any other female would have certainly collapsed under the strain. She was also pretty ticked off at Fang. Light put on his best poker face before replying. “You have my word,” he lied. He was going to have to figure out something for this. The two canines ignored her and went back to the discussion at hand. Fang’s expression became far more serious than earlier. The wolf thought it might have something to do with this organization he was going up against. “I know the location of the headquarters of this particular organization…but I did not come across this information easily…I lost many good men to get this information and I’m entrusting it to you. It was many years ago and if they knew their location was compromised they would have moved out and destroyed the facility. Knowing this do you want to gamble that they’re still there?” he asked Light with unwavering red eyes. Light smiled and said thank you to the other canine with a paw shake, his paw in his mechanized paw. Finally, I’m getting somewhere, he said to himself. He almost didn’t mind the collar anymore…almost. Light wasn’t sure whether Cameron was cut out for field work. One thing he could tell, however, was that Fang didn’t want him to fail…despite the collar and the threats. Light determined the leader of the Fanged Teeth wouldn’t have sent the cheetah with him…unless Fang hated her and wanted her to fail too and be out of his fur. Light was hiking through some loose sand and she wasn’t complaining as she followed a few yards behind him, carrying a pack of her own. It was a pretty good pace since it was somewhat open terrain. At least Fanged Teeth given Light the supplies needed to make it to a town some ways away to prevent being tracked by anyone as he left. Fang had even led the rest of the group to believe the wolf was dumped after being tortured and killed. The excuse he’d given for Cameron’s leave was a black ops data gathering assignment. The wolf’s ears twitched and he held a paw out to stop the cheetah. “Sshhh…quiet,” he whispered as he turned his head and listened with his ears behind him. Are we being followed? By whom? he asked himself, almost certain he’d heard something or someone walking behind them. Cameron took the assault rifle off her back and put the end of the stock into the spot between her shoulder and chest. “What is it?” she asked in a whisper as she turned to face where Light was looking. “Light?” called out the familiar voice box of a certain Dachshund. “Frank, over here,” Light replied and waved at him. He breathed a sigh of relief when he saw Frankie was with him. The wolf put a paw on her shoulder. “It’ll be okay,” he replied in order to try to calm the tension he was picking up from her. She relaxed under his paw and felt herself blush before shaking his paw off and growling. “Don’t touch me, Wolf,” she hissed as she started off slowly, walking past Light in the direction they’d been traveling. “Don’t go too far ahead,” he said without looking over his shoulder to her. He walked forward to meet up with Frank and Frankie. “I’m glad you guys are okay,” he said with a smile. It was then he remembered the collar. “D***,” he said as he was sure they’d know they were alive. “Nice hardware there, Light,” Frankie said as he put a hand on the collar. The wolf nodded as he looked over in the direction Cameron was travelling off alone. “We best get going. Don’t want her to get too far ahead of us and end up getting lost,” he added with an eye roll. “I’ll explain everything on the way,” he said as he took off after the cheetah with Frank and Frankie following behind him. “So did they get the weapons,” Frank asked with a sly grin as Light walked in front of him, just out of earshot of the cheetah. Frank chuckled to himself as he brought up the rear of the group as they hiked through the dessert in the dark night. From inside the Fanged Teeth headquarters on the outskirts of the city, Fang was watching the video feed from the collar. “Who was the one that said they saw the bodies at the base of the cliff?” he asked with a growl at the mutt that had given him the report earlier at what the retrieval team had found. He held him up in the air with his mechanical paw. “Bring them to me. I’m going to give them a lesson in how to identify whether a body is dead or not,” he added with a sadistic grin while licking his chops with his long canine tongue as he put the collar in hibernate mode from the computer terminal to save power. Fenice Nera is not named after the band. I just googled it and a band name came up...complete coincidence. Last edited by lightwolf21 on Wed May 02, 2012 5:32 pm, edited 4 times in total. superwow! One thing's for sure: you don't get bored with Light at the party! light has an special charm or Fang it has a heart cause that looked relatively easy. Maybe a tiny and ugly one... but a heart. Nice work as always, and I'll get an idea on the sketch to you shortly-- thanks for doing the little guessing game and providing the reward. Well, seems Light is in a bind due to poor planning. Wonder how he'll get out of this one. What part in the dual continuity is this? I'll try not to. You'll have to wait and see. ;3 Dual continuity? >.> This is the parallel story to Valerio's but takes place on the date listed at the top with the chapter number. Valerio's Episode 50 arc takes place starting on March 3 so...a few days after this. gonna start reading this now. This should be fun. Hope you enjoy it. :3 Always welcome new readers.